The first ever live televised league game from Tannadice will only live in the memory for the performance of Rangers who for all but the opening few exchanges completely dominated this encounter. The first save of the match came in the first minute when Christian Dailly took a return pass from Craig Brewster but couldn't get enough power into his shot to trouble Goram. 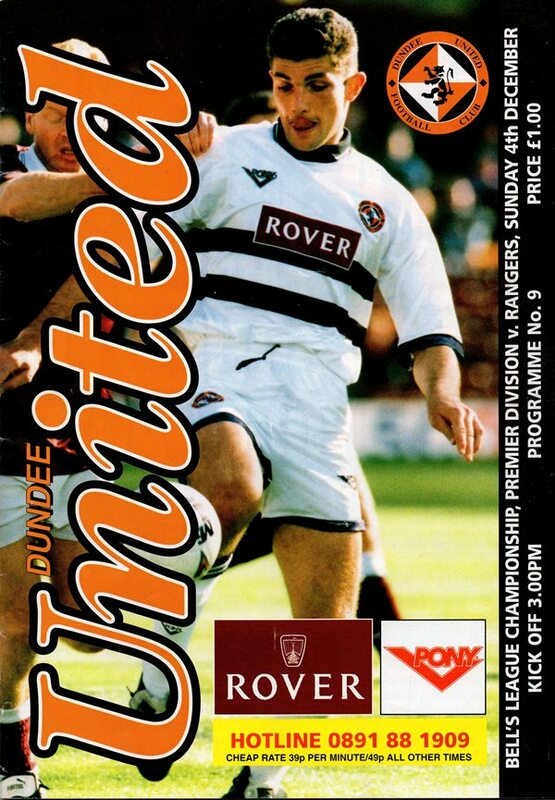 Evidence of the threat Rangers posed came in the fifth minute when Durie went clear on goal, but fortunately for United he stabbed the ball wide of the post! Three minutes later came undoubtedly one of United's best chances of the game. Stuart McCall swung wildly at a cross and sliced his clearance upwards and back towards his own goal. Craig Brewster was under it when the ball felt, but he sliced his attempted volley way over the bar. In the 17th minute United fell behind and unlike the previous four games there was to be no way back. Brian Laudrup collected a ball form Durie out on the left and drifted past Billy McKinlay and Alex Cletand before crashing the ball in at the far post. The Tannadice goal then proceeded to enjoy something of a charmed life as Rangers ran amok. 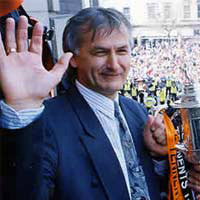 Charlie Miller wasted a header when he had the goal at his mercy by nodding the ball past the near post from Huistra's right foot cross; McCoist shot narrowly wide; Huistra slid the ball inches past the far post from an opening made by Laudrup and this agonising spell ended with Durie blazing a shot just over. United failed to take advantage of a rare moment of indecision ten minutes before the interval whistle which came with the Tangerines grateful the deficit was no more than that superb Laudrup goal. 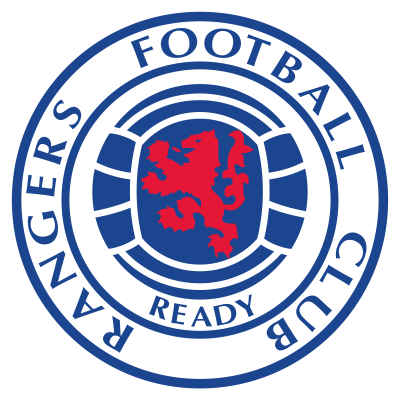 As at the start United made a bright opening to the second period, winning several corners, but Rangers were soon back on the offensive and increased their lead when a free-kick landed at the feet of Pieter Huistra who wheeled and sent a shot just inside the post. Four minutes later and Rangers moved further in front. That man Laudrup won the ball from Maurice Malpas and drove speedily down the inside left channel before sliding an inch perfect pass into lan Durrant, a substitute for Ally McCoist, and he neatly side-footed in the third. In the latter stages of the match United did have a couple of worthwhile efforts. A header by Dailly from pointblank range was kept out by Goram's feet. Craig Brewster was given a free-header, but headed wide when it looked easier to score and a raging freekick by Billy McKinlay was just too adjacent to beat Goram. The corner count was 12-4 in United's favour, but that in no way reflected the difference between the sides on an afternoon when Rangers turned on their Sunday best for the cameras. Golac commented, "I hope I've learned a few things from Rangers who played brilliantly"
November has been an excellent month for us, having finished it undefeated with two draws and two wins. It is no coincidence that in our last two games when we have played our best football of the season, the side has been very close to the one which helped us lift the Scottish Cup last May. Mainly due to injuries, I have had to chop and change the formation almost every week. However, for the match against Falkirk last Saturday, Gary Bollan for the suspended Alex Cleland was the only change I had to make and similarly this week, finding a replacement for Gordan Petric who is suspended is the one alteration I have to contemplate. Whilst results earlier in the season were not all that they might have been, I always knew that we would turn the corner, because even if we had not been winning, we were continuing to make chances. Slowly, however the things I have been working for have been coming to fruition. Including the game against Celtic, we have come from behind on five occasions in the last four games, but remain unbeaten. That demonstrates the character and spirit within the side. We have also scored some great goals, particularly against Hearts and Falkirk. These are the qualities that I like to see in my teams, but there has still been a tendency to concede soft goals with Falkirk's opener a case in point. First and foremost, today we cannot afford the lapses in defence which have seen us go behind in so many recent games and if we can produce the same kind of disciplined performance throughout the side there is no reason why we cannot make it a hat-trick of wins and start December in the same way as we finished November - ON THE WINNING TRAIL! Now is the time for our supporters to really get behind the side and help us make even further strides up the table as we take on Rangers this afternoon. They are obviously the biggest club in the country and have the best squad with quality throughout their ranks. However, we have a score to settle with them after losing at Ibrox when Craig Brewster had a great chance to put us back on level terms before we went down 2-0 in a match which came less than 48 hours after our European tie in Slovakia. Between now and the end of the year we face Partick (away), Kilmarnock (home) and Hibs (away) and with Paddy Connolly having returned from injury and Scott Crabbe not too far away from a return, the immediate outlook appears much brighter. BUT FIRST WE HAVE THE THIS AFTERNOON'S VERY IMPORTANT MATCH WITH RANGERS TO CONTEND WITH.